Zainab Aleqabi, the nation of Iraq, 28 years old, she left her leg, when she was only seven, a bomb went off in her home in Baghdad. After that incident, she moved to UAE in 2001 and later she joined the Sharjah University, where she studied Pharmacy. “I was never into sports, and to be honest, it is not very much encouraged in our culture for girls to be into gyms, workout or sports. While at university, I started experiencing back pains and the doctor said it was because of the way she walked. She was cried and unhappy after the doctor advised her to get into fitness as she felt being forced to do these sports activities. "I didn't even know how to swim then so I went to my sports coach at the university. I asked her whether I could swim, showing her, my one leg and she said: 'Don't ask silly questions, just wear your swimming costume and come'. My coach told me never to think there is any sport that I can't do. She really got me into swimming and made me swim." After her college, Zainab could not go for swimming regularly due to few ladies came only for swimming pool in her area, after joining to the gym and start working out she fell in love with different kinds of activities. She stated, "I basically fell in love with the aspect of being fit and fitness then became a lifestyle and not an option for me. It's a way of healing, pampering and taking care of our own self. 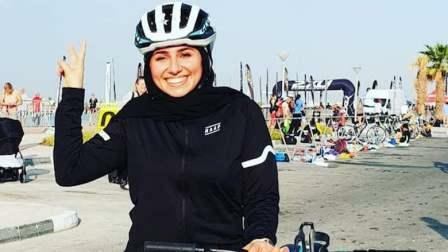 I realized that if I want to achieve more in my personal life and undertake different activities and adventures then I had to be fit,"
Zainab has assumed the Dubai Fitness Challenge with great zeal and also looking to take part in her woman’s triathlon set to take place on November 9. “To be fit comes naturally to me now but what the fitness challenge has done is that it has made me more motivated because we can follow up with people through the Dubai Fitness Challenge app and see how people are working out and updating their fitness levels. It has helped me push myself more and encourage us by showing different free classes where we can train with more like-minded people. “When I see people work hard and able to achieve their fitness goals, it inspires me to work harder. It makes challenges look simply. Last year, I took part in the Dubai Women’s triathlon and I am looking to join it again this year. The good part is that the triathlon also comes during the Dubai Fitness Challenge so all the better. Zainab, who swims, does weights at the gym and is also a cyclist, told: "My message to everyone is that never put an upper limit on yourself in terms of your dreams and achievements. Just work and develop yourself and utilize your time to the fullest. Love life and let no one bring you down."